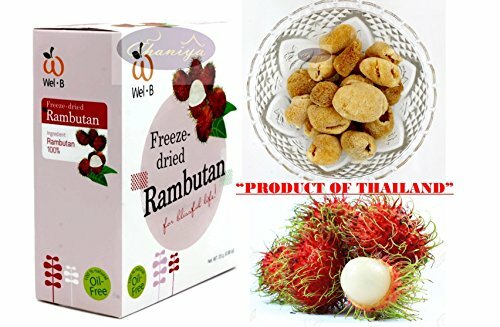 Freeze-dried Rambutan Sweet-and-sour "Rambutan" is one of the best and unique fruits in hot countries. Eating it can make you feel fresh all the time. 1. It is crispy and easy to eat. 2. It can be served with milk for your breakfast for freshness and vitamins. 3. It can be added in your tea for fruity flavors. 4. It can be mixed with ice and yogurt for your tasty smoothies. 5. Your bakery and ice cream can also be topped with these yummy fruity pieces. Freeze-dried is one of the latest technique in food preservation. This method is preferred by NASA to preserve food for the astronauts. It works by extracting moisture from food by vacuum at subzero condition (-40°c). As well as locking in all of the essential nutrients, neither heat nor oil is used which meant being healthy can be done without being compromised. Sweet-and-sour "rambutan" is one of the best and unique fruits in hot countries. Eating it can make you feel fresh all the time. It is crispy and easy to eat. Please keep in a cool and dry place. View More In Dried Mixed Fruits. If you have any questions about this product by Freeze Dried Fruits, contact us by completing and submitting the form below. If you are looking for a specif part number, please include it with your message.